Do you need EPoS cash registers for small business? Get in touch with CCM Epos today for effective solutions that will be tailored to your business and its needs. We have a broad range of cash registers that are perfect for businesses in all sectors. Call us today for a competitive quotation on all of our EPoS systems. CCM Epos are the leading suppliers of EPoS cash registers for small businesses. Whatever sector your business operates in, we have the perfect solution for you that will speed up operations. Help your business grow with our easy-to-use solutions. Our retail EPoS systems are powered by TouchPoint servers, and are ideal for businesses in all sectors. We tailor all of our EPoS cash registers for small businesses so that you have a system that is centred around your requirements. Cash registers of the past do not cut it in today’s fast-paced world. Every small business cash register we supply comes with Windows-based software which gives you the option of installing it on many computers; there is also multi-revenue and multi-screen options. The straightforward nature of our EPoS cash registers for small business makes them a valuable addition. Product sales and cash management are simplified which will take away any worries that you may have. With our cash register small business service, you can monitor profits with the real-time reporting function. If you need to change or add anything to the menu or transactions, this is easy to do with the navigational system in every one of our EPoS cash registers for small business options. If you own a small company in the hospitality sector, our EPoS cash register for small businesses is an essential investment. 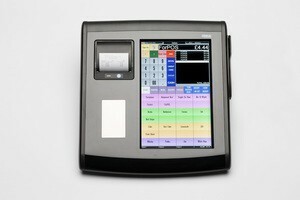 The industry requires hospitality systems that are fast and easy-to-use which is why our cash registers are perfect. You can take cash transactions and breakdown product sales to see strong and weak points with our EPoS cash registers for small business. Every EPoS cash registers for small businesses we provide come with all of the features you need to operate a successful hospitality venture. There are options such as voids, discounts and no sale options. If you own a takeaway restaurant, then we have customisable options that will take and monitor orders. With many companies offering cash registers for small business, it can be hard knowing which company to choose. At CCM Epos, we are committed to supplying excellent EPoS cash registers for small businesses and tailor our solutions to you and your needs. The team are devoted to supplying our customers with excellent EPoS cash registers for small business. We believe in our product and know that it will help streamline your operations and make you more efficient than before. Every service will be bespoke to your needs and you can trust our company to provide an excellent service all the time. We don’t just supply EPoS cash registers for small business. The team also provide support services and consultation for customers who need an extra level of support when they choose our small business cash register service. Click here to find more information about our company. Before investing in one of our EPoS cash register for small business, we recommend that you visit our case studies page. We have written up our solutions have helped other businesses with their cash register needs. Call CCM Epos today for the best EPoS cash registers for small business solutions.